Fennel becomes a completely different vegetable after a trip through the oven – it loses its classic licorice bite and becomes tender, nutty, and just a bit sweet. 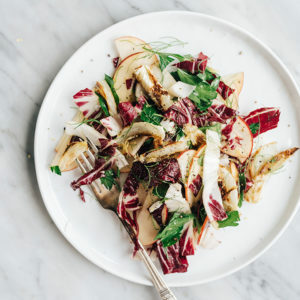 Tossed with apples and radicchio, this roasted fennel salad is crunchy, savory, bright and fresh. It’s a shockingly easy recipe, but so impressive. It can be difficult to get down with salads once the weather turns decidedly cooler. Once fall weather settles in permanently, I pretty much pivot from a summertime vegetarian to a staunch meat and potatoes lady. 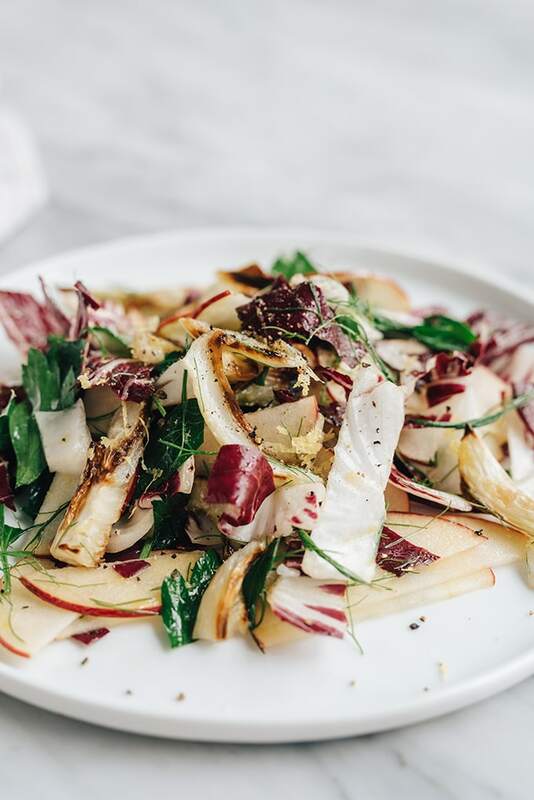 Fall veggies might not be as colorful or diverse as summer’s harvest, but they’re still damn tasty if you toss together the right combinations, like this roasted fennel salad. 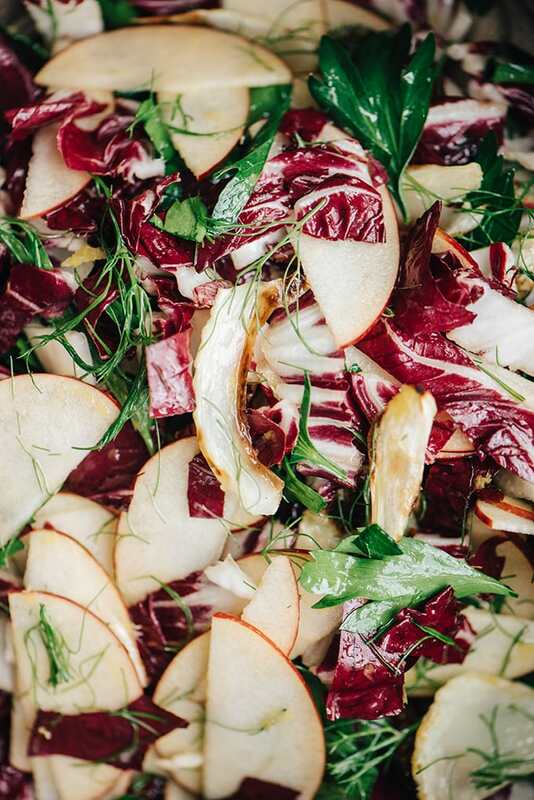 Meaty, nutty fennel, crispy sweet apples, and peppery radicchio come together to create a salad that’s nutty, vibrant, and simply perfect for sweater weather. 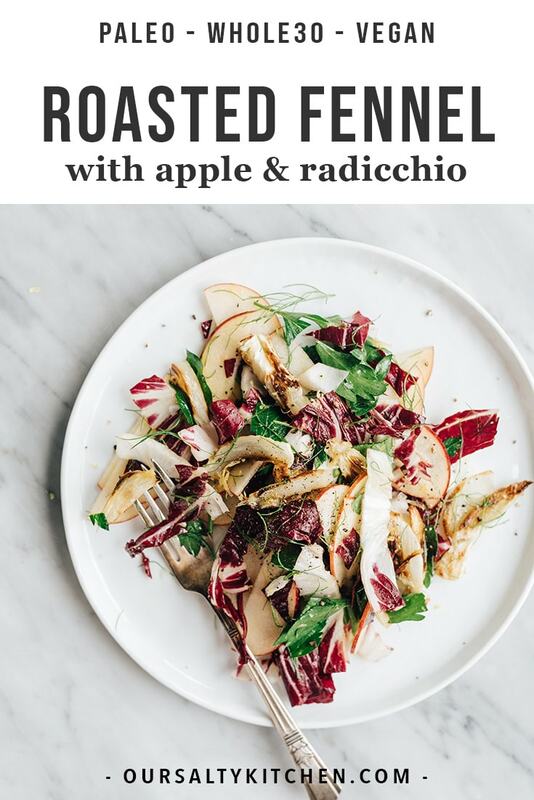 If you’re not a fan of fennel, hear me out, because the character of roasted fennel is so very, very different from its raw form. It loses all of its bite and most of its licorice-y flavor profile after a trip through the oven. The result is a mildly sweet, nutty flavor profile that’s completely unexpected in a wild and wonderful way. It’s really freaking tasty and totally worth the extra step. Obviously this recipe starts out with a bulb of fresh fennel. Thank you, captain obvious. You’ll remove the stalks and reserve the fronds (they’re a nice addition to the salad base), then slice up the bulb into 1/2″ wedges. Fennel can look like an intimidating vegetable, so if you’ve never worked with it before, this is a great video on how to prepare fennel. After you’ve sliced it up, you’ll toss the fennel wedges with some oil and then roast them until they’re soft and caramelized. The roasted fennel will be tender and golden brown, with a mid, nutty flavor. It becomes a totally different vegetable, because science. Amazing. 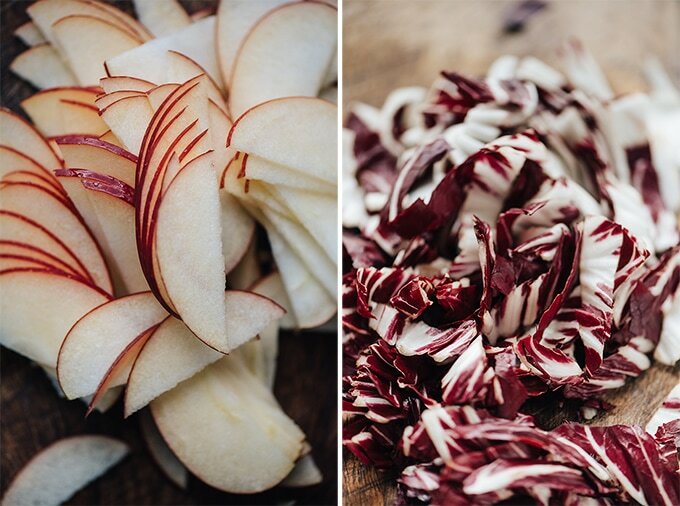 While the fennel is roasting, you’ll slice up some crispy apples and some peppery radicchio. I used crimson crisps that we picked up during our annual apple picking trip, but any crisp, sweet apple will do. Go really thin with your apple slices, and use a mandoline if you have one. 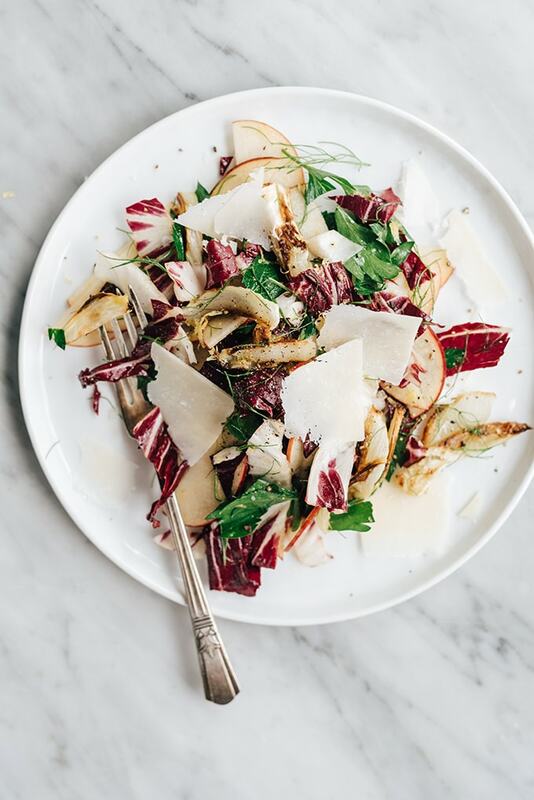 Radicchio brings some color into an otherwise very brown salad, but more importantly, it’s slightly peppery, mildly bitter flavor profile is a great contrast to the sweet apples and nutty fennel. The dressing isn’t even really a dressing – just some lemon juice and zest, a few glugs of really good olive oil, and some salt and pepper. Toss n’serve baby. If you believe as I do that most situations in life can benefit from a little bit of cheese, add a few shavings of raw parmesan or pecorino. It’s totally optional (I’m talking to you vegans!) but gives each bite a creamy, salty finish. I like serving a special salad like this with a very simple protein like pan-seared fish or roasted chicken. Both are mild enough not to compete with the bold flavors and easy enough to prepare. This salad holds up really well at room temperature, so it’s a great option for family-style dinner parties or large events (I’m looking at your Thanksgiving day) where dishes might be sitting out for a bit. or Thanksgiving recipes board now! Fennel becomes a completely different vegetable after a trip though the oven - it loses its classic licorice bite and becomes tender, nutty, and just a bit sweet. 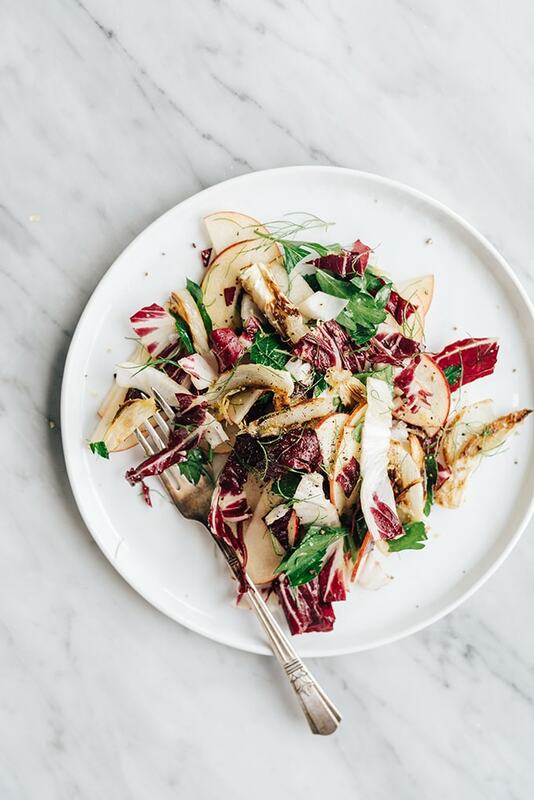 Tossed with apples and radicchio, this roasted fennel salad is a cool weather recipe you'll turn to again and again. It's bright and deeply flavorful, but also satisfying and nutritious. Slice the stalks from the fennel bulb, reserving the fronds for the salad. Peel the outer layer with a vegetable peeler, then cut in half lengthwise. Remove the core, then slice into long, thin wedges lengthwise. Toss the fennel with 1 tbsp oil and spread onto a baking sheet. Roast until the fennel is cooked through and browning around the edges, flipping once halfway through, 25-30 minutes. 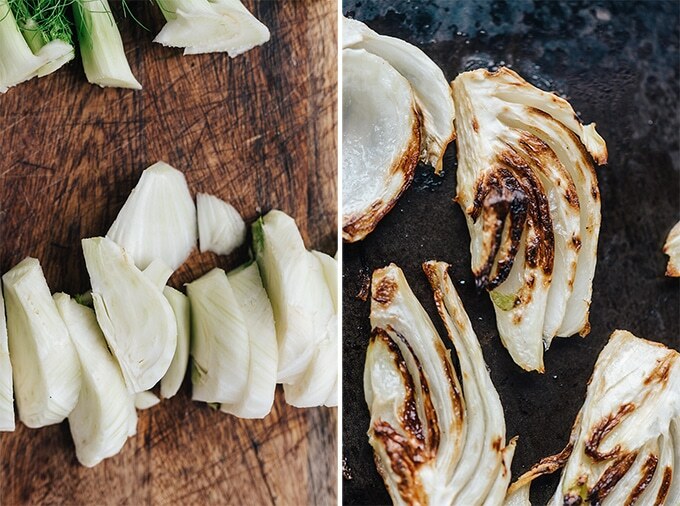 While the fennel is roasting, prepare the remaining ingredients. Core and thinly slice the apples (a mandoline is useful here) and the radicchio, then transfer to a salad bowl. Roughly chop the fennel fronds and parsley, and add those to the bowl. 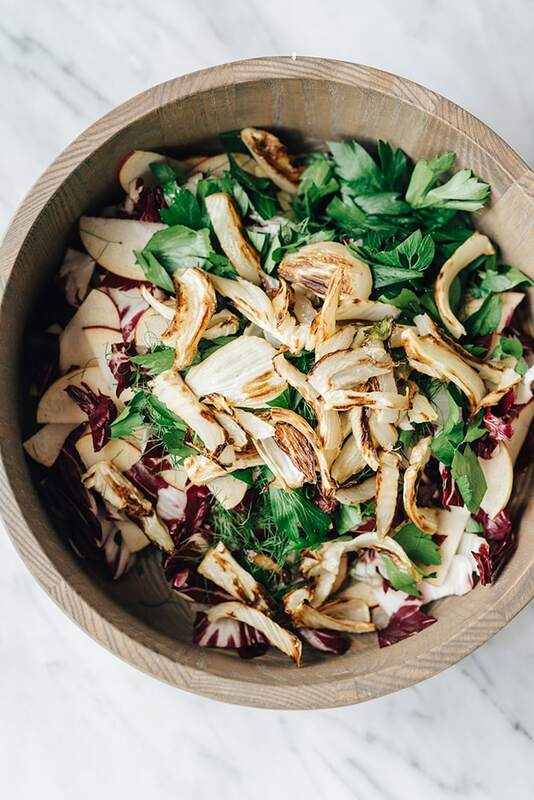 Add the roasted fennel to the salad base. Zest the lemon over the salad (I love my microplane zester), then add the lemon juice, olive oil, salt and pepper. Toss, and divided onto four plates. Top with the shaved cheese if using, and serve immediately.